Check out this awesome three (3) color Hood, Roof & Rear Lid Rally Stripe Graphics kit. 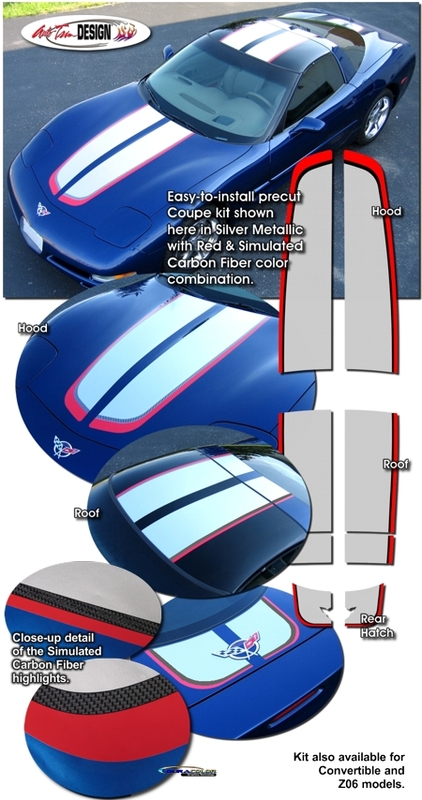 Created to simulate1 the 2004 Commemorative Edition Z06 rally stripes, these graphics are packaged as a set of precut pieces that are ready to install in one (1) of five (5) different color combinations2 - NO TRIMMING required! This graphic stripe package is not just a set of straight strips in a box. Our graphic kit consists of prefitted and contoured pieces as shown in the illustration. Kits are specifically made for the '97-'04 Chevrolet Corvette Coupe, Convertible or Z06 and will not fit any other vehicle. 'Click Here' to view Color Combinations available. 1 While great effort was made in regard to size, shape, color and simulated carbon fiber pattern, kit pieces are NOT exact replacements for OEM graphic parts. Thus, when ordering pieces to replace damaged OEMparts we recommend ordering and applying adjacent pieces as well. 2 Due to manufacturing limitations, Hood and Roof pieces for color combinations other than Silver Metallic with Red/Blue and Simulated Carbon Fiber will be approximately 0.75" (19.05mm) narrower. Similar to OEM graphics, simulated carbon fiber pattern does not carry onto Roof and Rear Lid pieces. Highlight for those areas feature a color close to Light Charcoal Metallic.